Hot summer temperatures are the leading cause of roof degradation and premature failures. The sun’s heat is able to break down the roofs’ ability to function as designed; causing leaks, cracks, alligatoring (a pattern of cracks across the roof surface that mimics an alligator’s hide), brittleness and loss of thickness to the roof membrane. A highly reflective roof coating system can prevent this damage from occurring and protect your roof for years to come. Roof coatings act basically like a sunblock to the surface of the roof. The coating protects your roof from IR and UV damage, performing very similar to a sunblock, if only a sunblock lasted 10 years before needing a new application. 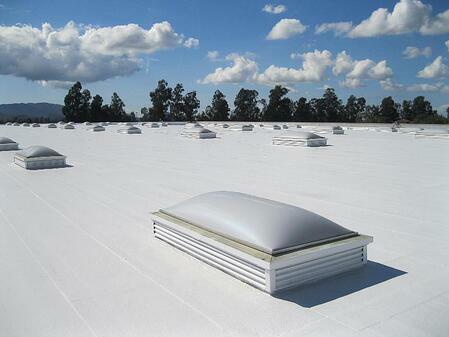 Highly reflective roof coatings are generally referred to as a Cool Roof Coating or System. They are applied directly on top of an existing roof, creating a new, fully adhered, waterproof membrane, covering and protecting the existing roof. These systems can be re-coated every 10-15 years to maintain a watertight roof without ever having to worry about a costly tear-off. High reflectivity and emissivity are important factors to consider when choosing a cool roof coating. These properties function to properly reflect the heat away from the building and radiate any heat that was absorbed back into the atmosphere. The solar reflectance index (SRI) takes both the solar reflectance values and thermal emittance values to measure a roof’s ability to reject solar heat, as shown by a small temperature rise. Coatings with the highest SRI values, provide the coolest choices for roofing. 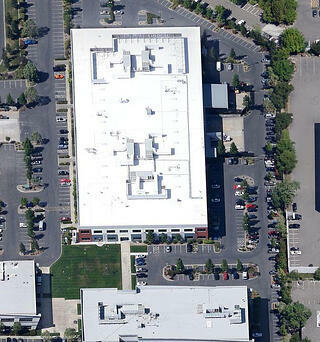 AcryShield roof coatings provide excellent SRI values. The three most popular coatings are the AcryShield A400 with an initial SRI of 104, the AcryShield A510 with an initial SRI of 106 and the AcryShield A500 with an initial SRI of 104. If you are looking for an even higher solar reflective coating, check out the AcryShield Ultra High Reflectance A590 with an initial SRI of 117. These roof coatings reduce roof temperatures and prevent extreme temperature fluctuations from occurring. They also prevent the break down of materials and the roof from drying out, as they reflect the majority of the UV light away from the roof before it can cause any damage. 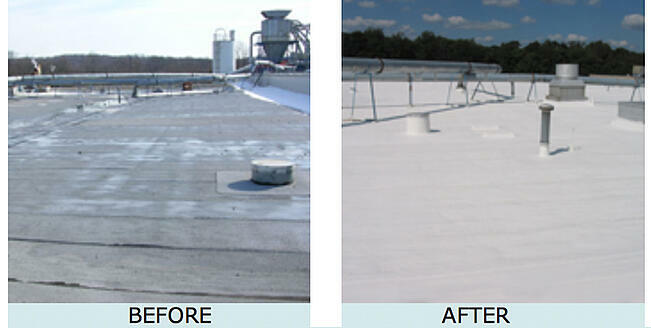 For more information on Roof Coatings, download our Considering Coatings? A Free Guide to Roof Coating brochure. As hot weather is quickly approaching, protecting your roof top from the sun's damaging UV rays with a highly reflective cool roof coating system is ideal. Many people do not realize the primary cause of destruction and pre-mature deterioration to your roof comes from the sun's powerful UV rays. The IR and UV radiation from the sun causes harm to the roof by drying out the surface. The IR radiation promotes temperature damage as it can heat the surface of an unprotected rooftop up to 160˚F and back down to 90˚F in a given day. This wide range of temperature fluctuation causes the roof to significantly expand and contract, leading to flashings and fastener failures. Over time, these areas are not able to keep up with the movement of the roof, causing the fasteners and flashing to come off or loosen. The UV radiation from the sun causes brittleness and destroys the surface of the membrane, making it thinner and less durable. Cracks and alligatoring can occur across the rooftop and the flexibility becomes compromised, leading to water penetrating into the building during the next rain storm. These issues can be easily resolved by using a Cool Roof Coating System. The highly reflective roof coatings used in these systems protect your roof by reflecting the majority of the IR and UV radiation away from the roof, prohibiting the sun from causing temperature damage and embrittlement. By reflecting the heat away from the roof top, the roof only absorbs a minimal amount of the heat, keeping the roof much cooler in temperature, allowing it to remain flexible without premature weathering or aging. The AcryShield High Reflectance A590 white roof coating, reflects up to 92% of the sun’s radiation, meaning only 8% of the heat on a hot summer day will be absorbed into the building. Cool Roof Coating Systems are favored by building tenants and owners because they are able to keep the inside air temperature of the building cooler without using the air conditioning system as often. This is an excellent way for tenants and building owners to save a great amount of money on their energy utility bills and put less stress on their HVAC equipment, allowing them to last longer. The ability to reflect the sun’s heat also lengthen your roofs' lifespan, lower roof maintenance costs, and protects your rooftop from premature aging. For more information on our highly reflective white roof coatings and Cool Roof Systems, download our FREE Full Line Brochure!